Family game night. 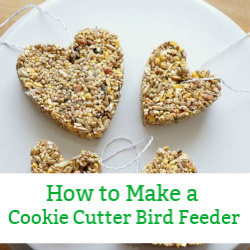 Is this something your family does? 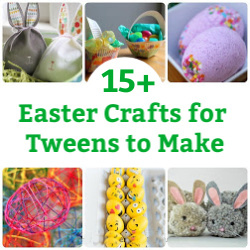 You know, put away the electronics and sit around the table playing a board game or card game. Our family doesn’t have a regular game night, but we do love playing board games together. 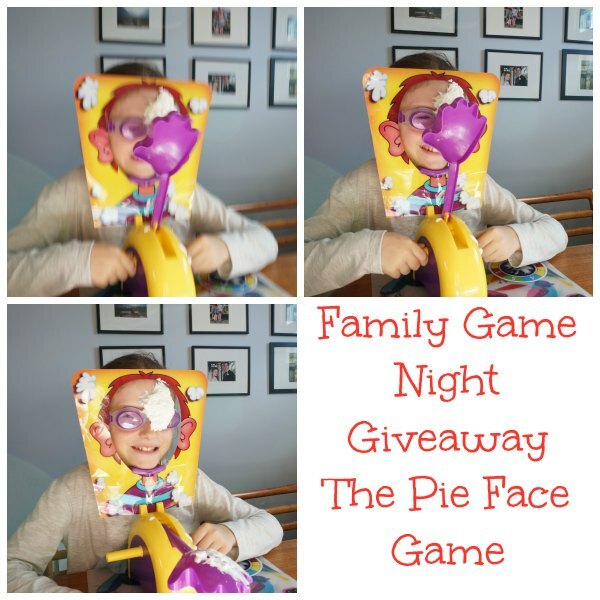 When Hasbro’s new The Pie Face Game arrived at our door a game night was booked. In fact, my youngest daughter was so excited to play she couldn’t wait for the rest of us. She gathered up 5 of her favourite (or perhaps least favourite) stuffed animals and started to play the game. Guess what? My daughter lost the game! Her bear won. 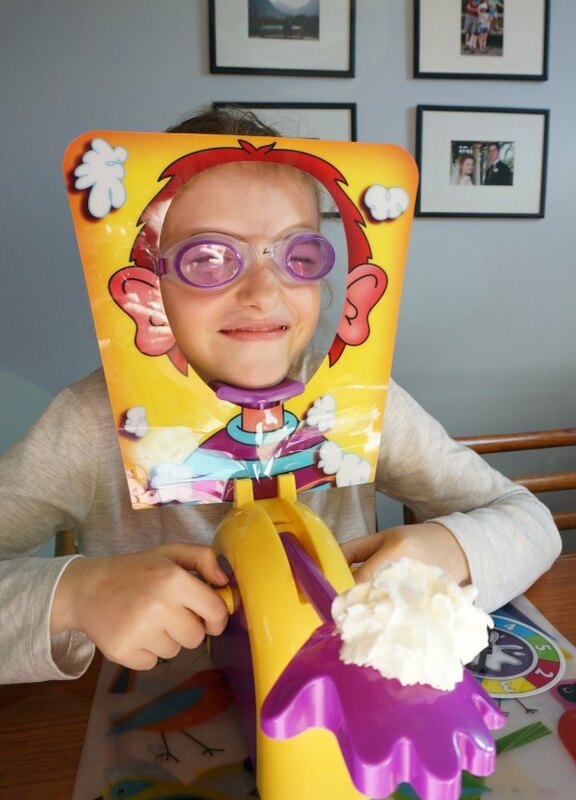 When it was time for our family to play she was better prepared…goggles. 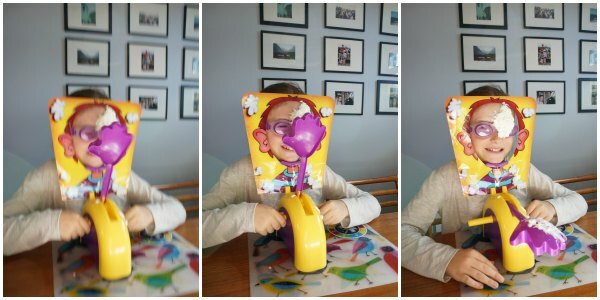 I mean if you are going to splat GayLea Real Whipped Cream in my kid’s face, you had better believe she’s wearing goggles. Let the fun begin. The object of the game is to be the first to reach 25 points. 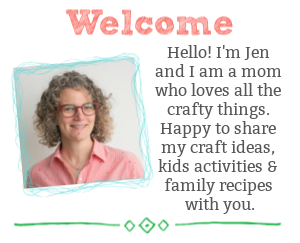 Spin the spinner and turn the pie handles for every number you spin. Click. Click. Click. You never know when the whipped cream pie is going to fling onto your face. 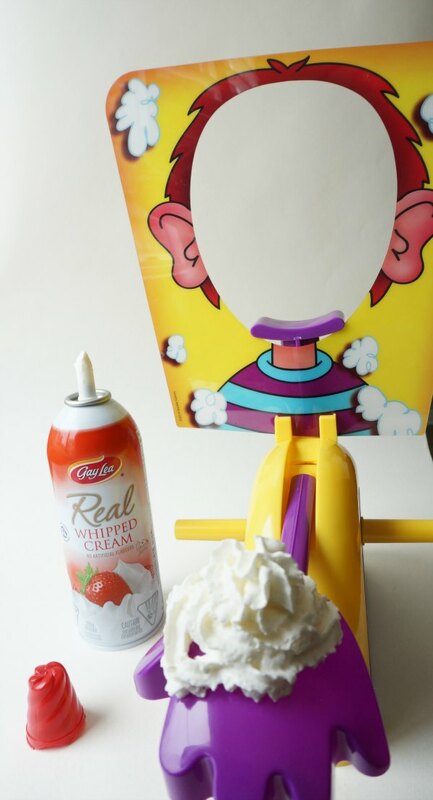 Oh, and if you do end up with a face full of whipped cream, you don’t get any points for that turn. Fun and challenging. Guess who won this time around? Me! * Game of Life, Jr.
To enter, simply leave a comment below letting me know what is your family’s favourite game to play together? Are you a family of card sharks or is real estate, and Monopoly, more your thing? Those are all my favourite games! We’re big Scrabble lovers as well as Bananagrams. With my son, we love to make up games to play at this stage hehe. We are more card sharks than the real estate type. Every weekend we have the grandkids over for sleepovers. On Sat we always have game night, the kids look forward to snacks that they make as well as sitting back and just playing the games they love. The one that all of them pick out is Operation. It’s was my game when I was younger. We play a lot of kids games with our three grandchildren. The one we’re into now is Go Fish! We have a tough time winning now? Our kids like Operation. It costs us a ton on batteries, but they love it. We have several board games that we rotate through, but Operation is played more than the others. My oldest son’s favourite game is monopoly, which is also mine because it’s helping him learn about money and how to make change!